DD5LP/P – May 17th. 2017 – DL/AM-060 Laber. Having missed the EU-NA S2S event the previous Saturday because of feeling ill, I wanted to get out and activate a summit while the weather stays nice. I decided to try 60 metres again along with 40 metres as a back up. So the modified for 60m SOTABeams linked dipole along with the FT-817 and amplifier (for 40 metres usage – 60m would be barefoot 5 watts PEP). Laber is about an hours drive from my home QTH – to the valley station of the cable car in the village of Oberammergau (famous for its “Passion play” that has been held every 10 years for several hundred years). 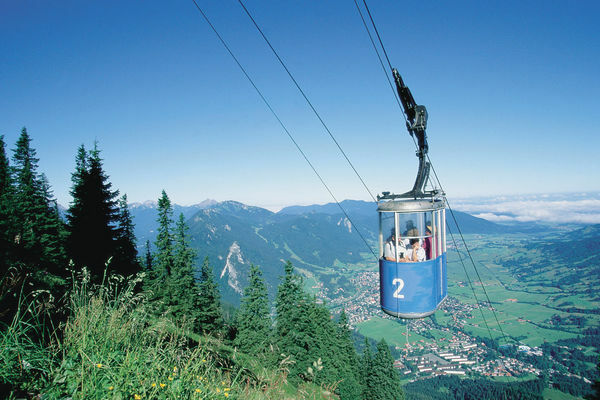 The cable car is the oldest in Germany at over 60 years old and takes about 10 minutes to reach the summit. From the mountain station of the cable car it’s only about 30 metres walk to the very summit with its convenient bench seat. All went to plan except squeezing the antenna into the available space with the extra length for 60m while there are other people on the summit. This meant I got started about 15 minutes later than planned. I started on 60 metres using frequencies that overlap between the UK “bandlets” and the IARU WRC15 allocation that we have in Germany. The band did not cooperate – perhaps the antenna was not good with the ends on 60m relatively close to the ground. In any case I only managed contacts into Germany and Switzerland – locals from where I was. After switching to 40 metres things were better and I actually called a non SOTA station first, this was PI4C at a museum near Schipol Airport in Holland. It was being operated by Trevor a British ex-pat in Holland who came originally from a town about 10 miles away from where I lived as a child! Small world! Band conditions on 40m were variable, some of the usual chasers being weaker than normal and some the normal strength. At the end of my activation I could hear the lightning strikes that had been reported earlier by some UK stations, but in the end the storm never got to me thankfully. As the winds were increasing I decided to shut down and pack up after about an hour in the hot sun. While closing down someone came to ask what I was doing and he seemed quite interested, so I gave him a DARC introduction brochure to Amateur radio. In my rush now to pack away, I managed to break the central insulator/feed-point plastic of the antenna so that will have to be replaced or repaired. It’s lasted 5 years of some quite rough handling, so it as done well. All in all, I was happy that I got out and did an activation in the nice weather – can you believe in a few days snow is forecast again for the summit (and this is the middle of May!). 60/40/30/20m Linked dipole antenna (Modified SOTABeams Band Hopper). Modified QAMP amplifier (35 watts on 40m). The location is not a good one for 60 metres due to the restricted space for the dipole. I need to look at the compression level in the FT-817 Mic RF-Speech-Clipper and back it off a little. The output BNC socket on the amplifier needs to be tightened and locked (glued) in place before its turning breaks the cable. The centre insulator on the dipole needs to be repaired or replaced. DD5LP – October 13th. 2015 – DL/AM-060 Laber. 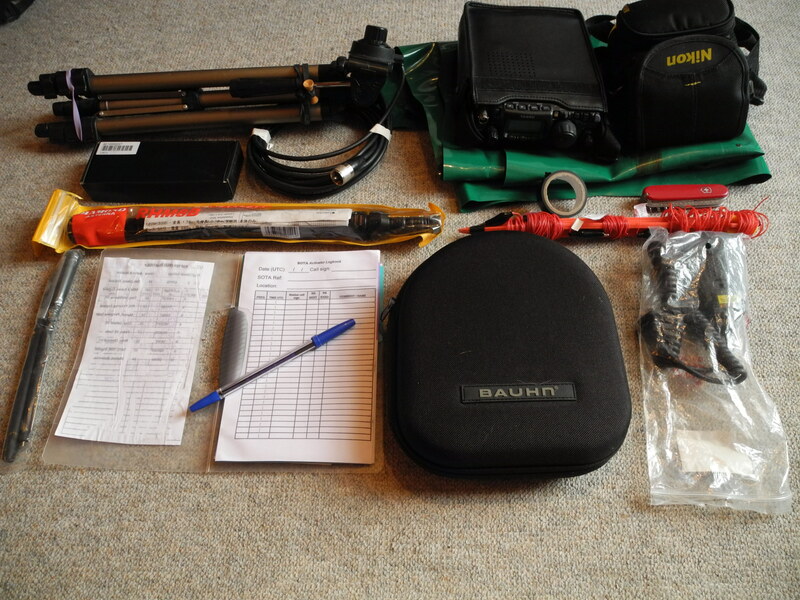 As I am planning a trip over to the UK and I also want to activate some German summits where space is limited and some walking distance is required, I have been trying to sort out a simplified kit to take. The first thing that I removed from my usual 10Kg+ two bags set-up was my Ramsey Amplifier. While I know the 25w on 40m or 15w on 20m does make a difference compared to the basic 5w from the FT-817, the extra size and weight of the amplifier, its cables and the two 5000 maH LIPO batteries with a battery booster unit (to take the 11v from the LIPOs up to 13.8v), simply can’t be justified in a basic kit. The next issue was the antenna. I have a linked, Inverted-V dipole from SOTABeams and an OCF from Aerial-51 (Spiderbeam) I usually pack both of these and the Aerial-51 with its 4:1 balun does account for some weight and size, as does either the 6m or 10m “Squid-pole” (telescopic fibre-glass pole) that I need to support them. So if I take the FT-817 with an internal 2500 maH LIPO battery and a spare 2500 maH LIPO, what do I run this into for an aerial? Some time ago I bought a Diamond RHM-8B loaded vertical whip which is designed to fit directly onto the BNC socket on the FT-817. Apart from the fact that using this puts stress on the FT-817 front panel, it also doesn’t radiate very well (receive is fine). About 6 months ago I looked at moving the antenna from the rig to a camera tripod (even though Diamond say not to do this). I bought a second-hand HAMA camera tripod which is strong but also light and folds down to a small size. To this I added an SO-239 base and coax cable. With the help of a BNC to PL-259 adapter, the diamond sits on top of the tripod. Early tests showed this worked and worked better with a random length of wire acting as a counterpoise radial. It had the problem however that the tuning on the slide-able coil under the telescopic antenna (the type that we used to see on transistor radios) was now very compressed at one end of the range and very difficult to get the SWR down. The latest modifications have been to add a horizontal extension wire to the top of the telescopic whip (one of two lengths, one for 40m and one for 20m and above) and to add 4 not just one wire as a counterpoise. These wires being of different lengths. One would expect that these wire must be spread out in different directions not to affect each other, however I have found that leaving the wires wound together in one direction works equally as well. Initially I used the teflon strengthened antenna wire but this proved to be too heavy, tipping the antenna over, so I replaced this wire with very thin and light PCB hook-up wire (AWG 28 if I remember correctly). Last weekend, I put this antenna together INSIDE the house to just see how well it works on receive compared to my external wire antenna (a 40m loop). I was amazed to find that OH0Z (on an island between Sweden and Finland) was booming in at S9+ on both antennas, so I gave him a call from the 5w, internal antenna, set-up and he actually came straight back to me! He gave me a 5-9 report, however as he was in a contest he would give everyone a 5-9 report and I didn’t want to delay him by asking for a real signal report. The key point was he copied my complete over without asking for anything to be repeated, so the antenna was working! Now time for a test – to see if the antenna would work as well from a summit and to see if I had removed too much from the pack. 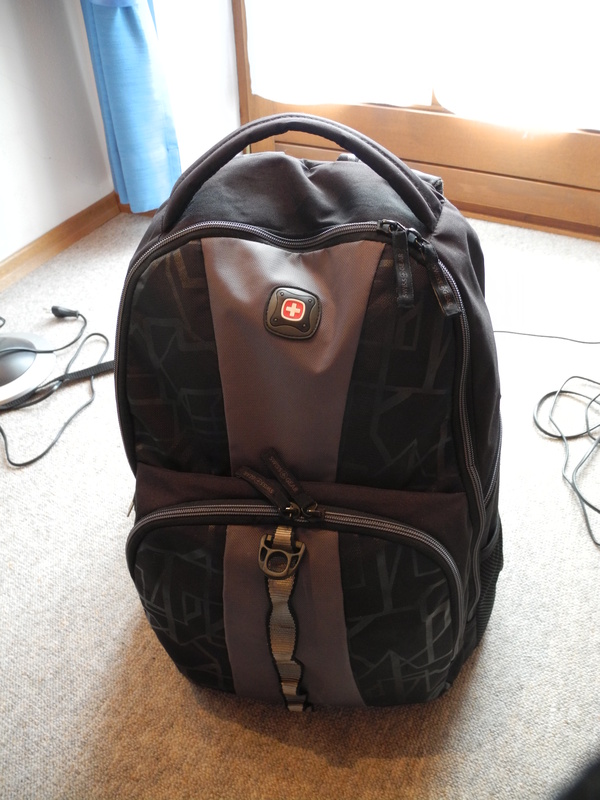 Here are the contents and the small rucksack that it all packs into and weighs under 6 kilos. Middle row, left to right: Diamond RHM-8B antenna, Plastic stake with radial and extension wires wound on it (PVC tape and penknife above it). Bottom row, left to right: FT-817 6m, 2m & 70cm rubber-duck antennas, Log book and pen, Headphones, FT817-microphone. Laber is a very easy access site with one of the oldest gondola lifts still working taking you right to the summit (and a restaurant of course). The mountain overlooks the village of Oberammergau where the famous religious play happens every ten years. The last time I activated Laber in 2014 I got soaking wet and the views were often blocked by clouds. Guess what … the same happened this time! I had planned to go on Monday however the weather here was terrible (I only later found out that Laber had been above the clouds in lovely sunshine all day), so I delayed the activation by a day. Oberammegau is about 1hr and 15min from where I live, so not the closest of summits but a good one to try the small kit out on as it has limited space to set-up. The trip down was uneventful except that it started to rain – something that would be a constant parrt of the day. The “Laberbahn” cable car, has only 4 cars on it and runs to a specific schedule, meaning that you can only ascend or descend every 30 minutes. As I was ahead of my planned schedule when I got to the lower station, I was not worried that I’d have to wait a while for the lift. As it happened I was the only person going up in this car and I took several photos – shown below – of the view from the lift. As it turned out this was a good idea as the journey back down later in the afternoon had 12 people packed into the car and for most of the 15 minutes trip, nothing could be seen through the windows as we were mostly in the clouds. Once I got to the summit, I decided to get out and take a few more pictures and then set up the station, rather than sampling the delights of the restaurant. I expected there may be some issues with the set-up as I had not used this approach on a summit before, I thought it better to start, just at the point that the rain got heavier. In fact apart from a little tangling of the counterpoise wires, the set-up went together without any real issues. I started on 20m and the set the coil to the noted reading I had used in the house. When then checking the SWR from a little way below where I had the antenna, it was fine (this was not to be the case when I later went onto 40m where some adjustment was needed and the new value is now noted for the future). I checked to see if I could hear any of the recently spotted activators – I could not. The HF conditions over the last month have been the worst I have experienced since starting on HF about 4 years ago and it looked like today was going to be an extension of those propagation conditions. Undeterred I found 14.285 KHz free, and started calling CQ SOTA while typing in a spot through the rain globules on the front of the smart phone, After a couple of attempts, I managed to get the spot out and kept calling CQ SOTA. I was very happy to have Gomes from Portugal (CT1HIX) come back to me and give me a 5-1 report, he was then followed by Pedro EA2CKX with a 5-2 report. I then was amazed at the signal from Alexi RA1AVP/1 about 1850 kilometres away and gave me a 5-7 report. At this point I was happy, the antenna set-up was definitely working, but then came the best call of the day from Phil VE1WT in Nova Scotia, Canada at about 5500 kilometres and a 5-3 report. I am sure all four of these chasers have fantastic antennas and receivers, but the fact was that they were receiving me in some of the worst propagation conditions for years and that with my lightweight set-up. As I had no more calls on 20m, I once again checked to see what other activators were on and switched to 40m to call Hajo DJ9MH who was up on Ebersberg DM/BM-115 after a couple of calls I git him and we booked an S2S for the day. After that I found 7.150MHz to be free and spotted myself there calling and managed a further eleven contacts. The activation stopped when the log book had got so wet that I could not write to it and I was feeling rather wet and cold but happy that everything had gone so well. So it only remained then to pack-up head into the restaurant for a hot Chocolate drink and then wait for the gondola to take me back down the mountain after a very successful day. The minimum configuration worked exceptionally well. Even with just 5w and a limited antenna in bad propagation conditions amazing things are possible on the HF amateur bands, if you can spot yourself. As we approach the change of clocks in Europe, getting to a summit and activating early enough to catch the EU_VK long path window is going to become more difficult, so with this activation, I hoped to perhaps make a short path contact to a VK chaser and/or a US chaser or activator in the late afternoon. The weather forecast was for dry, sunny weather up to 26 degrees centigrade. As I found out on the last activation, my Ramsey QRP amplifier that I use to boost the FT817’s signal had decided to stop working, so once I decided on Wednesday to activate Laber on Saturday, I used what spare time I had to take apart, fault find and repair the amp. Once repaired, I also ran tests and found a healthy 15W output on 20m and 25W on 40m. 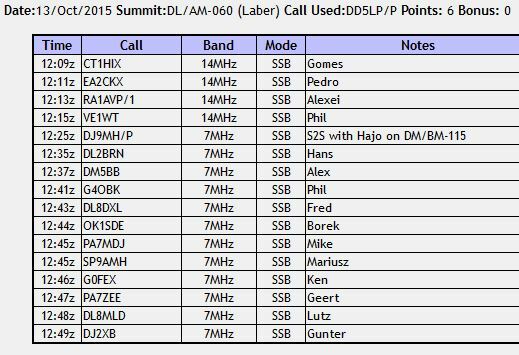 Also for this activation, I wanted to try 15m as this should give the best chance of a contact into the US at the time I planned to be on the summit. This meant, I would be taking the Aerial-51 404-UL antenna rather than the SOTABeams linked dipole as my model of the linked dipole only has links for 20,30,40 and 80m operation. The Aerial-51 antenna is heavier than the SOTABeams due to its balun however with my modification it sits nicely on top of either my 6metre or 10metre squid pole. I planned to take the 10m high one this time, but later decided on the lighter 6m pole. The advantage of the Aerial-51 antenna is that I can change bands without having to lower the antenna remove or connect a link and raise it again. By Friday all was set for Saturday, so everything was laid out ready to be packed into the car for the about 1.25 hour drive down to Oberammergau (where the Laberbergbahn starts) the next day. Laber is one on the mountains looking down onto the town of Oberammergau. Oberammergau is famous for its “Passion Play” which has been run every 10 years since 1634 when it was put on as an offering to God to rescue the town from the plague. In 1632 the pestilence, a plague, had infested Oberammergau and by 1633 nearly every family had come to experience death. People, brought down with the pestilence, vowed to perform every ten years at the towns cemetery, a Passion play depiction of the suffering and dying of Christ if there would be no more deaths by the pestilence. On Pentecost 1634 the population of Oberammergau performed for the first time the “Play of suffering, dying and revival of our lord Jesus Christ”: on a stage which has been built at the pestilence cemetery, over the graves of those who had dies of the plague. Access to the Laber summit is either via one of two walking tracks taking around 3 hours from the town or using the oldest cable car system in Germany which takes about 15 minutes from the valley to the mountain station with the journey stopping half way up. This halt is needed to unload or load people at the base or mountain station. There are 4 cars on the system, each of which can hold up to 12 people. They are not large but are standing room only with just one small box to sit on in them. On arriving at the summit station, it’s only a short walk down the (very steep) track to get to the edge of the AZ, however the best location to set up is to use one of the benches on the actual summit, next to the cable car station and restaurant. The weather on Saturday was not at all like what had been predicted. It was foggy and cool and on the drive down rain showers started. As part of this trip we were to visit the Weis Church and look around Oberammergau, so hopefully the weather would clear up in the afternoon. It didn’t and by the time we got to the valley station of the cable car, the mountain didn’t look very inviting at all. Cold, misty and light rain. The webcam monitor in the cable car station showed the weather on the mountain as even worse than in the valley. We asked the lift operator if he thought it would pass and he said it was set in for the day (according to the Internet). After some consideration, we (my wife and I) decided to risk it and hope that the wether would improve – which it did a little for about an hour of the 2 hours that we were on the mountain. It was damp more than wet most of the time. Visibility varied from being just 20m to being able to see Oberammergau in the valley. Certainly not the views we expected but I got to work 37 stations over about 100 minutes. To my surprise I worked some on 10, 12 & 15m as well as the usual 20 & 40m. The Aerial-51 antenna is not designed to work on 12m without an ACU, but it worked well enough for one contact and that was an S2S into Finland! 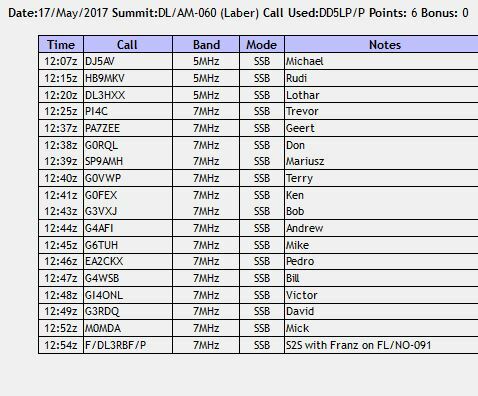 I managed six S2S contacts around Europe – actually a duplicate S2S (the 7th) when the other station called me again when I changed bands. There were some contests running which made finding a free frequency difficult and the habit of contest stations not to check whether a frequency is free before starting to call CQ is annoying to say the least. 40m had an S8 noise level from the microwave antennas and equipment about 50m away, so all of the (many) contacts I had on 40m were strong to overcome the local RF noise. 16:30 local (currently 14:30 UTC) is too early for contacts into the US or Australia. Once the clocks move back an hour at the end of this month, it may be worth trying again as 16:30 local becomes 15:30 UTC, however a new test would probably need to be from a hill that does not need a cable car to access it as many of the cable cars will be out of service in November while they get their annual inspections, upgrades and approvals before the skiing season starts in December. Being on a walk-up hill would also give the possibility of staying later, which could be an advantage for contacts to the US, but later in the day will make it past midnight for even those VK stations in Western Australia, so I wouuldn’t expect any contacts from VK. Contests, and contest stations can be a pain. Apart from them taking up most of the band, their signals being too wide (or overpowering the receiver), there attitude of just calling on a frequency without checking it first and even if they do check, ignoring anything other than an S9 reply is a PITH! I need to look again at how I can reduce the equipment that I take with me. For a winter activation – possibly involving skiing-in to a site, I need a minimum set of gear and a simple to install and remove antenna that does not obstruct other people – so most likely a vertical anntenna with radials for each band. Some more thought is required around this.